Taoiseach’s speech at College Green yesterday evening paid ‘homage’ to Obama’s Chicago rally speech when he won the presidency in 2008. IMITATION IS FLATTERY, right? 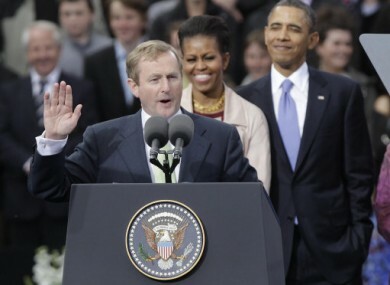 Taoiseach Enda Kenny appears to have paid “homage” to Barack Obama in his introductory speech at College Green before the US president took the microphone. In this mash-up put together by East Coast FM – listen here – the first few lines of Kenny’s speech were practically word-for-word the first few lines of Obama’s speech to a rally at Grant Park, Chicago on the night he won the US presidential election in 2008. Kenny’s spokespeople have since said that the reference was “entirely deliberate”. If there’s anyone out there who still doubts that Ireland is a place where all things are possible, who still wonders if the dream of our ancestors is alive in our time, who still questions our capacity to restore ourselves, reinvent ourselves and prosper, today is your answer. The similarities are so significant that it is clear that Kenny’s speechwriter was intending to make reference to Obama’s speech in Chicago. It’s just a shame they didn’t tell anyone. Email “"The dream of our ancestors and founders" - The Kenny/Obama speech mash-up”. Feedback on “"The dream of our ancestors and founders" - The Kenny/Obama speech mash-up”.